Any nation who cuts cords from its center or origin ultimately ends in devastation. However, if a nation is fortunate enough to have center of their strength (i.e. the Universal Divine Man of the era) among them, then it must adhere to him. Since, his company and spiritual beneficence will unveil the secrets of their innerselves and ultimately, they will find Allah. What is center of Faqr? In the above piece of poetry center means the soul or the focal point of something. In fact, it is the point upon which the whole strength of something lies and without which it is non-existent. Similarly, in the path of Faqr the center or the focal point has a lot of significance. Now the question arises that what is center of Faqr and what is its significance? Center of Faqr is the assembly or court which makes the important decisions regarding all seekers of Allah. Additionally, it resolves all the outward and inward matters of the people from Allah’s group and in His way. Furthermore, different orders are passed here, and decisions are made to promote people in Allah’s way and in His group. In fact, the center of the Divine system of creation is also at the center of Faqr. Where is the Center of Faqr? The center of Faqr is the place where the possessor of Faqr resides. For example, when Prophet Mohammad (pbuh) was in Medina, the city became the center of Faqr because of his presence. Therefore, preparation of battles, religious and worldly decisions, purgation of innerself of the seekers of Allah and all other adjudications always took place in Medina. Even the physical and spiritual Mohammadan Assembly held in Medina. Hence, the center for any matter was the place where Prophet Mohammad was physically present. Being distant from the focal point or center results in indiscrimination, disturbance and dissension. Center can be only one sacred entity and because of that entity that center is also only one. The incidence of the demolition of mosque al-Dirar verifies the aforementioned. Like other mosques, this mosque also had an imam who called Adhan (Muslims call for prayer) and Muslims offered salat. However, the purpose of building this mosque was to detach Muslims from their center which is Prophet Mohammad. In fact, this was a conspiracy of the disbelievers. In other words, the center of Faqr cannot be the place where the possessor of Faqr is not present. The Holy Quran also mentions this conspiracy of the non-believers in sura at-Taubah, verses 107 to 109. Verily, in these verses Allah Almighty condemns the construction of this mosque. Therefore, Prophet Mohammad ordered to demolish and burn this mosque. The Mohammadan Assembly decides all the matters of the seekers of Allah even today. Since the sacred self of Prophet Mohammad is the origin of Faqr which is his heritage. Correspondingly, pivot or center of Faqr also changes as per the decision of the Mohammadan Assembly. The center of Faqr is the man in whom the Mohammadan Reality manifest in its perfect and original form. Moreover, because of whom the Mohammadan Assembly takes revolutionary steps in the path of Faqr. Verily, the Holy Prophet is the origin of Faqr, and Ali Ibn Abi Talib is the door of Faqr. Ali was the commander of the faithful, leader of the pious and the one who resolved problems of others. Moreover, he was the bravest in the way of Allah (shair-e-khuda) and the leader of the knowers of Allah. Ali is also famously known as the king of the spiritual leaders and the Companion of Prophet Mohammad. Not to forget he was that Companion of Prophet who had incomparable love and loyalty for him. The point here is that all the aforementioned attributes qualified Ali to possess the trust of Faqr Ali after Prophet Mohammad. Therefore, after Holy Prophet left the physical world, Ali became the center of Faqr. Later, all the spiritual schools of thought or mystic orders started from Ali. As Ali was the bearer of Faqr, resultantly at the time Kufa became the center of Faqr. After the people of cloak, the glory of Faqr transferred to Sultan-ul-Faqr II Shaikh Hasan of Basra. He got the trust of Faqr from Ali Ibn Abi Talib. Later, Hassan of Basra with the permission of Ali set the system of mysticism and spirituality. Undoubtedly, this system is still intact and followed to achieve Divine union (visal) and gnosis of Allah (marifa). All the orders meet Ali Ibn Abi Talib through Hasan of Basra. One exception to this is Naqshbandiyah order which meets Abu Bakr Siddiq through Salman of Persia. The treasure of Faqr transferred inwardly from one spiritual heir to another and eventually reached the third Sultan-ul-Faqr, al-Ghawth al-Azam. Therefore, his sacred self then became the center of Faqr. Undoubtedly, his renowned and enlightened self is above all praises and one cannot contain it in literary compositions. Shaikh Abdul Qadir Jilani showed many miracles, but his greatest miracle was the revival of Islam to its original form. Truly, he took spiritual knowledge, mystical experiences and Faqr to their ultimate heights. Therefore, Prophet Mohammad made him the center of Faqr. By virtue of Shaikh Abdul Qadir Jilani, the city of Baghdad remained the center of Faqr for many spiritual guides. After Shaikh Abdul Qadir Jilani, when the trust of Faqr transferred to Sultan Bahoo, Shorkot became the center of Faqr. Sultan Bahoo wrote 140 books and every book begins with the explanation and exegesis of Ism-e-Allah Zaat. No one unveiled the secrets of Ism-e-Allah Zaat as much as Sultan Bahoo did in his books. Sultan Bahoo also revealed the importance and the method of inscribing Allah’s name on body. In his books Sultan Bahoo not only uncovered the secrets of Ism-e-Allah Zaat but also Ism-e-Mohammad. Corresponding to his such countless efforts and high ranks the Mohammadan Assembly designated him as the center of Faqr. Even today millions of seekers of Allah get beneficence from him spiritually at his shrine. Prophet Mohammad grants the permission to spread the beneficence of Faqr. However, after Sultan Bahoo, the Mohammadan Assembly followed a certain pattern for the spiritual successors of Sarwari Qadri order. Now Prophet Mohammad makes that country center of Faqr where the Sarwari Qadri Shaikh resides. 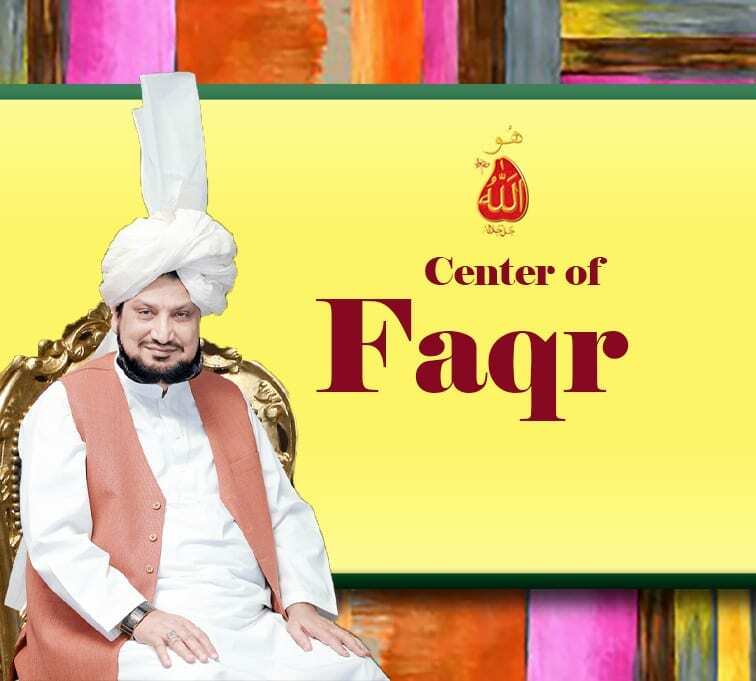 This is done so the Sarwari Qadri Shaikh during the process of spreading Faqr can refer to the center of Faqr as needed for the outward and inward matters of his devotees. In short, Prophet Mohammad shifts the center of Faqr to the place where ever the bearer of Faqr goes. Thereafter, Prophet Mohammad grants Faqr to fortunate seekers by virtue of the center of Faqr of the era. The above incidence concludes that despite being the origin of Faqr, Prophet Mohammad ordered Abdullah Shah to go to Sultan Bahoo to gain the treasure of Faqr. Since at that time the sacred shrine of Sultan Bahoo was the center of Faqr. Therefore, he had to come to India to attain Faqr. The center of Faqr changes according to the orders from the Mohammadan Assembly. For Sultan Abdul Aziz and Sultan-ul-Faqr VI the center of Faqr was the shrine of Sayyid Mohammad Bahadur Ali Shah. Therefore, Shaikh Abdul Aziz and Sultan Mohammad Asghar Ali often visited and stayed several nights at his shrine. In fact, whenever Sultan Mohammad Asghar Ali visited the shrine of Bahadur Ali Shah, thousands of seekers surrounded him. He then prayed for everyone and resultantly the seekers attained their wishes. After the death of Sultan Mohammad Asghar Ali, Sultan-ul-Ashiqeen adorned the Divine guidance. The center of Faqr still temporarily remained the shrine of Sultan Mohammad Bahadur Ali Shah. Therefore, till 2011 Sultan-ul-Ashiqeen visited his shrine along with his disciples. In 2011, Sultan Bahoo ordered Sultan-ul-Ashiqeen to try to reinstate the spiritual beneficence from the shrine of Abdullah Shah. Since 1942, Sayyid Mohammad Abdullah Shah had ceased his spiritual beneficence. As increasing number of people coming to his shrine had worldly desires and were not seeking his Divine beneficence. Therefore, to fulfil his responsibility, Sultan-ul-Ashiqeen visited the shrine of Sayyid Abdullah Shah in September 2011. There he got very upset to see the miserable condition of the shrine. As his shrine was only a small room and only one pillar remained erect whereas the other three had fallen. Therefore, in May 2012, he started the renovation of the shrine. Sultan-ul-Ashiqeen made sure the reconstruction of shrine is in correspondence to the architecture of the shrine of Sultan Bahoo. Sultan-ul-Ashiqeen instructed to build four minarets on all four corners of the shrine similar to the shrine of Sultan Bahoo. Likewise, he had them painted and decorated with glazed tiles. Moreover, on his instruction, on all four corners, within the minarets, they built turrets. He also got these turrets painted and decorated with glazed tiles. Furthermore, he instructed to tile the verandah and build the grave with marble. Hence, on the 30th August 2012, they completed the shrine reconstruction. Indeed, Sultan-ul-Ashiqeen had it built in such a way that it present a true reflection of Sultan Bahoo’s shrine. After the completion of the sacred shrine, on the 2nd September 2012, Sultan-ul-Ashiqeen arranged a grand Urs at the shrine. At this event, disciples recited manqabat (encomiums) and delivered speeches in honour of Sultan-ul-Tarikeen Sultan Sayyid Mohammad Abdullah Shah. This enlightened the audience with his life and teachings as well as his elevated spiritual status. Also, people became aware of the fact that Mohammad Abdullah Shah is the spiritual descendant and heir of Sultan Bahoo. During the Urs the center of Faqr shifted from Sayyid Mohammad Bahadur Ali Shah to Sayyid Mohammad Abdullah Shah. It was very important to shift the center of Faqr in that era. Since, the goal was to completely change the system of Faqr in the era of Sultan-ul-Ashiqeen. As in the previous eras the method of preaching Faqr was very different. Now, Mohammadan Assembly made decision to spread beneficence of Faqr at vast level which required a new system. The need of the era was to overpower and reveal bogus and so-called guides pretending to be the true Sarwari Qadri spirituals guides. Hence, to achieve this goal it was important to shift the center of Faqr. Most importantly to someone who gained the trust of Faqr from Sultan Bahoo and reinstated his beneficence to the world. Therefore, the Mohammadan assembly ordered to make the shrine of Sultan Mohammad Abdullah Shah as the center of Faqr. The Mohammadan Assembly increased Sultan-ul-Ashiqeen’s spiritual powers after the Urs, as a reward of his tireless efforts. Undoubtedly, these spiritual powers are increasing day by day so the world can benefit. Consequently, his Divine beneficence attracts the seekers of Allah from all over the world. Moreover, his extravagant spiritual powers have bestowed Divine Love to many seekers of world as well. Surprisingly, due to his spiritual attention these seekers of world transformed into fortunate seekers of Allah. Furthermore, he opened the doors of Mohammadan Assembly on his selected disciples. The perfect spiritual guide is Sultan-ul-Waham which means he is the Sultan of inward conversation with Allah. Undoubtedly, Sultan-ul-Ashiqeen is the perfect spiritual guide and the Universal Divine Man of the present era. The Mohammadan Assembly permitted Sultan-ul-Ashiqeen to grant waham (inward conversation with Allah) and ilm-e-dawat (knowledge of communication with the sacred souls of shrines) to any seeker of Allah. Therefore, through his power of waham he has granted many of his seekers with inspired knowledge (ilm al-Laduni). Indeed, this is the great beneficence of Sultan-ul-Ashiqeen in the path of Faqr. Previously Murshids granted ilm-e-dawat to male disciples and they could practice it at the shrine of the saint only. However, Sultan-ul-Ashiqeen has made dawat permissible to both male as well as female disciples. Moreover, he also removed the restriction for a seeker to practice dawat only within a shrine. Indeed, with the practice of dawat seeker can get guidance from all saints inwardly which is helpful in the path of Faqr. Undoubtedly, Sultan Mohammad Najib-ur-Rehman carefully used the aforementioned powers and his insight to spread the true soul of Islam. He selected seekers of Allah from all over the world especially the young generation and blessed them with Divine love. Through his spiritual attention he made them capable enough to play their role in the spread and popularization of Faqr. Explanation: Spiritual attention of the perfect spiritual guide is so efficacious that it changed the destiny of millions of people. For five years straight (2012 to 2013) Sultan-ul-Ashiqeen commemorated a grand death anniversary (Urs) of Sultan Mohammad Abdullah Shah. Sultan-ul-Ashiqeen’s untiring efforts in spreading Faqr are tremendous and incomparable with no personal benefit. Owing to his hard efforts, true intentions and Divine Favour, he passed each and every trial of Divine love successfully. He never hesitated to sacrifice his house, wealth or even life in the way of Faqr. Due to his intense passion, he won all the challenges and crossed every obstacle in his way of Divine love. Not even once he wayward from the path of righteousness. Sultan-ul-Ashiqeen granted Ism-e-Allah Zaat to whoever came to his court seeking Allah regardless of rank, cast, sect or religion. Moreover, he also travelled throughout Pakistan to spread the beneficence of Ism-e-Allah Zaat and invite people towards Faqr. Also, he granted the invocation and contemplation of Ism-e-Allah Zaat with or without oath of allegiance. Not to forget the credit of granting Sultan-ul-Azkar Hoo right after taking oath from disciple also goes to Sultan-ul-Ashiqeen. He bestows Ism-e-Mohammad to thousands of seekers of Allah every year. Previously, he granted Ism-e-Mohammad annually on the auspicious occasion of Eid Mawlid al-Nabi but now on 21st March as well. Sultan-ul-Ashiqeen laid the foundation of Tehreek Dawat-e-Faqr in 2009 to spread Faqr around the globe. This is a registered, non-political organization which does not belong to any sect. Moreover, the main aim of Tehreek Dawat-e-Faqr is to invite people towards Faqr. As only by attaining Faqr one can be blessed with the Divine vision and presence in the Mohammadan Assembly. Furthermore, the invitation of Tehreek Dawat-e-Faqr is open for all despite of their cast, creed or sect. In August 2006, Sultan Mohammad Najib-ur-Rehman laid the foundation of Sultan-ul-Faqr publications. Since then, this department has been successfully issuing monthly Sultan-ul-Faqr magazine. Every month this magazine publishes articles about Faqr and mysticism. As the sole purpose of this magazine is to invite and guide the seekers of Allah towards Faqr. In addition to the monthly magazine, the publications department has also published numerous books. Undoubtedly, Allah has bestowed Sultan-ul-Ashiqeen with unique ability of knowledge and intellect. Due to which he has beautifully written and compiled many books. Indeed, these books are like an illuminating light of guidance for the people on the path of Faqr. In order to spread the teachings of Faqr, Sultan-ul-Ashiqeen has used the electronic medium in the best possible way. Previously, the teachings of Faqr were transferred from one generation to another by word of mouth. However, now Sultan-ul-Ashiqeen has made efforts to spread the mystic teachings in a variety of ways using the modern resources. Some of the mediums are like e-books, e-magazines which are available on the Tehreek Dawat-e-Faqr websites. Moreover, under his supervision social media team made countless pages on social websites giving message of Faqr. For this purpose, team utilized famous websites, like Wikipedia, Facebook, Instagram, Twitter, YouTube, Pinterest, Google plus, etc. Indeed, this is a revolutionary step taken by Sultan-ul-Ashiqeen to spread the teachings of Faqr all over of world. This is beneficial for not only present generation but many future generations as well. Utilizing the modern internet medium, Sultan-ul-Ashiqeen also made arrangements of online oath for seekers outside Pakistan. In fact, he is the only spiritual guide who does online oath of allegiance in addition to physical al-bayah. Every year Sultan-ul-Ashiqeen travels excessively all over Pakistan for spiritual tours. The main objective of these spiritual tours is to spread the teachings and message of Sarwari Qadri order. Undoubtedly, Sultan-ul-Ashiqeen has spread the teachings and message of Faqr in every corner of the world. So that the seekers of Allah from any region of the world can easily benefit from the teachings of Faqr. Disregarding his personal comfort and health, Sultan-ul-Ashiqeen has gone above and beyond to spread the Mohammadan Faqr. After adorning the thorn of Divine succession, Sultan-ul-Ashiqeen did such work to spread Faqr which was never done before. In fact, he has done the work of three centuries in brief time span of thirteen years. Undoubtedly, this work will benefit and guide many future generations of the seekers of Allah. Due to all the aforementioned efforts of Sultan-ul-Ashiqeen, in 2017, Mohammadan assembly shifted the center of Faqr from the shrine of Sultan Mohammad Abdullah Shah to him. As mentioned before, the center of Faqr is where the bearer of the trust of Faqr is resided. Now, Sultan-ul-Ashiqeen is the bearer of the trust of Faqr, therefore he is the center of Faqr as well. The Divine glory appears in the bearer of Faqr or the center of Faqr, so his sacred self can attract the seekers towards him till the doomsday. Since, Sultan-ul-Ashiqeen has taken Faqr to limitless heights of progression therefore, he will remain the center of Faqr till doomsday. Hence, the place where Sultan-ul-Ashiqeen is resided is the center of Faqr now. Afterwards, the place of his shrine will be the center of Faqr till the doomsday. Under the supervision of Sultan-ul-Ashiqeen, his disciples are working to spread the teachings of Faqr even today. In 2009 Sultan-ul-Ashiqeen laid the foundation of khanqah of Sarwari Qadri order. The offices of all departments of Tehreek Dawat-e-Faqr, spiritual gatherings and the Urs ceremonies also take place in this khanqah. Since, Sultan-ul-Ashiqeen is the center of Faqr, therefore, his spiritual beneficence attracts the seekers from around the world towards him. Moreover, the world is now rapidly becoming aware of the exalted status of Sultan-ul-Ashiqeen. As his devotees and disciples are increasing numerously day by day. Hence, the heir of Faqr Sultan-ul-Ashiqeen intends to establish a vast Khanqah and Mosque for seekers of Allah. Furthermore, Tehreek Dawat-e-Faqr intends to construct the shrine of Sultan-ul-Ashiqeen with the new khanqah. Verily, till doomsday this khanqah and shrine will provide spiritual retreat to those who wish to enlighten themselves with Faqr. Certainly, no one can walk on the path of Faqr without Divine Love. And the Mohammadan Assembly entitled Sultan Mohammad Najib-ur-Rehman is as Sultan-ul-Ashiqeen which means the Sultan of Divine lovers. Therefore, all the seekers of Allah who seek Divine love will be bestowed with this blessing with the permission of Prophet Mohammad and from the sacred court of Sultan-ul-Ashiqeen. Sultan-ul-Ashiqeen himself attainted an exalted status in Divine Love and he is granting the same to his devotees as well. As only that person can direct to a certain path who knows about it and has himself travelled on it. The Mohammadan Assembly granted the aforementioned titles to Sultan-ul-Ashiqeen due to his enormous efforts in the advancement of Faqr. Explanation: (Mohammadan Assembly) has called Sultan Mohammad Najib-ur-Rehman as the Sultan of the Divine Lovers and the sun of Faqr. As he has illuminated the world with the teachings and message of Faqr. Also, Sultan Mohammad Najib-ur-Rehman is the true reflection of al-Ghawth al-Azam Shaikh Abdul Qadir Jilani. Furthermore, whoever wish to seek Allah must follow the bona fide self of Sultan Mohammad. We would like to hear from you. Leave us a comment and do not forget to hit the like button.